Alison grew up in Wilmington, Delaware, graduating from Ithaca College, NY and San Francisco State University. She has traveled the world and incorporates her collected stones and sea shells in Stellar Jewels Silver Handmade jewelry. 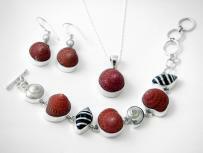 All pieces are made with Sterling Silver 925 and branded with her label "Stellar Jewels". Alison Wahl created Stellar Jewels in 2000, resulting in a stunning line-up of handmade truly one-of-a-kind jewelry. Today Alison resides in the tropical island of Maui where she is busy creating the upcoming collections. She continues to travel and explore, collecting new materials and inspiration from around the world.